Fashion Week San Diego celebrated its 10-year anniversary on Oct. 6 and 7, at the Port Pavilion on the Broadway Pier, Downtown. There were two pre-events leading up to the fashion shows. One was a VIP party with a fashion film screening on Oct. 4 at the LOT in La Jolla and the next evening was Art & Beauty Behind Fashion at the Andaz Hotel. The Port Pavilion, a waterfront landmark along the Embarcadero, overlooks the San Diego Bay with a breathtaking view that was perfect for an evening of fashion, with 18 creative designers brought to the runway. Founder and director Allison Andrews was presented with two official proclamations: a commendation presented by Councilmember Barbara Bray’s representative Justine Murray and a proclamation presented by Assemblymember Todd Gloria. The evening’s emcees were Jodi Kodesh and Jeff Krapf from NBC7 and Sleeping Giant Music provided a DJ each night, who spun the tunes. Friday night, Oct. 6, began with the annual Haute Dog Runway, with adoptable dogs from Rancho Coastal Humane Society. This adorable segment always thrills the audience. The evening continued with dogs on the runway wearing matching outfits created by The Stylish Bisou. Hola Swim brought a must-have swimsuit in polka dots to the catwalk. The unforgettable part of the evening was Tyler Forman, presenting a surprise marriage proposal to his girlfriend Taylor who said, “Yes!” The evening concluded with the sophisticated gowns by Haus of K2, which showcased their Indian-inspired designs. Saturday night, Oct. 7, began with Hulabelle Swimwear, with a message presented from the runway to educate and provide resources for cancer. 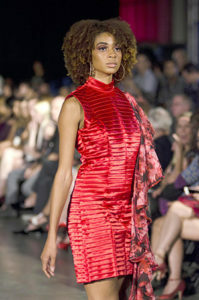 Returning designer Studio by Oseas featured an entire collection in red to bring HIV/AIDS awareness to the forefront. One of my favorites was the feminine collection of returning designer Isabel Vianey. Other standouts were the pleated works of art by Territa Torres and the resort wear of RHCreation, inspired by a “mango salad.” The finale wrapped up the weekend with the gorgeous designs of Baza, created with meticulous embroidery and beading. There was also a special presentation by Elisabetta Russo, Hollywood Music Awards’ Best Female Vocalist. She opened and closed the runway show and awed the audience with her musical performances. Russo was wearing an elegant gown by Raca Designs. Each night finished with an after-party at Florent on Friday and Oxford Social Club on Saturday. On Oct 8, FWSD17 culminated with its annual trunk show, presenting fashion awards at the Hotel del Coronado. Fashion Week 2017’s Top Designer award went to Baza. Haus of K2 came in second place, with returning FWSD16 Top Designer Territa Torres taking home third place. In addition, the Chelsea Casey Top Model award went to Anna Baretta. Second place went to Andrea Revilla and third place honors went to Sharika Thompson and Christian Ibarra. Stay tuned to fashionweeksd.com for updates, events, and the coming FWSD18. 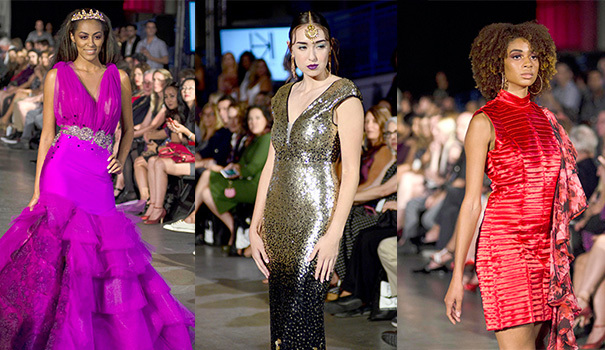 Nov. 9 | Vacanne Runway Show 2017 — A launch showcasing S/S 2018 collection by Valerie Barney. Fashion show will be at the Moniker Warehouse at 705 16th St., beginning at 6:30 a.m. For tickets, visit eventbrite.com/valeriebarney. Nov. 30 | A Decade of Stars — The 10th anniversary of Leonard Simpson’s 10 Best Awards and Fashion Show. Proceeds benefit the Doris A. Howell Foundation for Women’s Health Research. 5 p.m. San Diego Hotel & Marina, Bayside Pavilion. For tickets, visit howellgala.org. Dec. 10 | Silk & Spice — A luxury couture fashion show by Couture Collection by Giti Kooshkani. 5 p.m. Soufi Mediterranean Cuisine, 5915 Balboa Ave. For tickets, visit bit.ly/2ziVbvT.